“The facilities and support at the Sill Business Incubator are quite impressive. Student teams have developed software prototypes and interns have assisted with market research." You can create invaluable relationships with staff, partners, mentors and growing entrepreneurs. The Sill Business Incubator wants your business to succeed. As an occupant, you receive technical assistance, guidance and consulting that are necessities for business growth. We can guide you to reach your short and long term goals. Business coaches and mentors can help your company start-up and grow. Staff and partners work with you during each stage of development. Coaches offer feedback to improve sales and marketing, increase your bottom line and develop efficient operating procedures. Mentors provide valuable insight. The Sill Business Incubator carefully matches your needs with a mentor, or seasoned entrepreneur, who has overcome small business challenges. 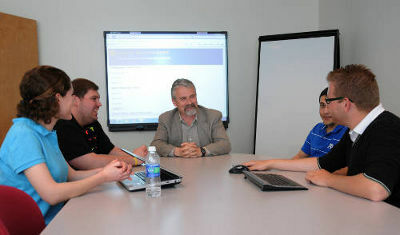 Clients connect with faculty and students from Juniata College and specialized career schools. Hands on learning opportunities are encouraged through class projects and internships. Recent client projects include technology applications, financial, marketing analysis and event planning. Our partners can identify your best local, regional, state or federal funding options. Since the Incubator is located in an Enterprise Zone and Keystone Innovation Zone, clients that meet requirements may apply for transferable state tax credits and low interest loans. You can also network with neighboring businesses located in the Sill Business Incubator and attend educational workshops. Use our print shop and conference rooms. Watch clips from the Juniata College Center for Entrepreneurial Leadership's video library to see how other entrepreneurs managed accounting, business planning, capital, human resources, information technology, marketing, legal, and operations with their start-ups. Or read a book from our resource library.